If there is one item in audio that is shaped by the whims and winds of consumerism more than the rest it is the transducer end of the audio chain being the loudspeaker. Forever reinvented and redefined and remeasured so that it can be remarketed and relabelled and resold to a new generation of consumers. In the mid eighties when CD players were being introduced loudspeakers were hastily relabelled “digital ready” as consumers were told that there old products would not accommodate the “dynamic range requirements” of the new media. I recall t he hostile response and fish eyed stare of some customers of the day as I attempted to explain to them that this was another piece of bogus marketing, they thought I was trying to sell them an unsuitable product against the wisdom of the brochure writers. A well known American company in the nineties decided to reinvent the satellite subwoofer speaker system by relabelling it as “acoustimass” and then very aggressively marketing it as a new technology, and by aggressive I mean they would actively litigate against any individual or company that might imitate or intimate that that product was not entirely as advertised. No heed was given to a priory companies such as JR or Audio Pro who had been pursuing subwoofers and satellite speakers with a high degree of technical excellence for twenty years beforehand. The satellite speaker eventually re-established itself into the “lifestyle” market, the consumer electronics industry has a penchant or labelling itself in such a fashion that it can then produce new products to fit the label. “Lifestyle” became such a popular CE acronym that the aforesaid American loudspeaker company patented it and then proceeded to litigate against any other entity that included it in their own descriptive practice. This is why when you come to Carlton Audio Visual you will find a, possibly bewildering, variety of so called “bookshelf “ speakers on display. They are not considered fashionable, they are not advertised in homemaker magazines, they are not the subject of protracted commercial legal cases to protect their use of advertising tagwords. They are however built carefully by manufacturers with terrific provenance who often spend man years obsessively voicing their products to achieve a particular timbre and musical presentation. There is a reason why so many speakers are roughly 30cm high by 20cm wide by 40cm deep and it is to do with the laws of physics as they relate to contemporary materials and opportunities of bandwidth, sensitivity, and degree of colouration in the final iteration of the product. A speaker box of this dimension is intrinsically less resonant than a floorstander, plus that trick that is stereo wherein two point sources in phase are received by a binaural creature such as a human so as to produce the soundstage between and beyond the speakers is aided by a compact drive unit emplacement. Meanwhile with modern materials and amplification a bookshelf loudspeaker will produce sufficient bass never to need a separate subwoofer for music with all the attendant matching phase and crossover issues that limit the potential quality of a sub/sat speaker design. There is a huge price range of this product category of compact-ish full range loudspeakers, ranging from $300 for entry point specials such as the PSB Image 1 through to our piece de resistance in the form of the Sonus faber Guarneri Evolution for $22,000. Our favourite economy priced speaker is the $500 Monitor Audio BX2 that continues to set sales records in the recent season. 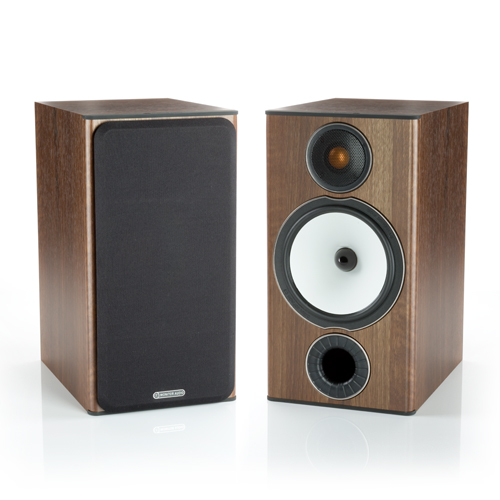 This particular speaker has been such a giant killer when it comes to playing something to a previously brand name fixated client who typically might have been looking at a bulk store floorstander or an American sub satellite system. The BX2 and its ilk has really come of market place age for us as we move away from selling entry point surround systems and increasingly are purveying a first system to Generation I’s that comprises a pure stereo amp with a pair of bookshelf speakers combined with a Sonos digital player and a Turntable. For me this is the mothers milk of Hi fi sales … lovely customers who love music and are buying their first system before their first house and who I just know are going to be long term clients if we treat them right. I personally am glad the glamour has gone from basic surround sound systems. Fundamentally people who listen to music are much more interesting than people who watch TV. There is a whole section of our retail marketplace in Australia that is devoted entry point surround sound systems where the basic sound quality has been lost but the brand names are preserved. The very typical formula is a tier one brand receiver with American brand floorstanding loudspeakers from a chain store. We find in our specialist business that we now either sell someone a NAD T748 Receiver or a Sonos Playbar system for that application. I will always try to steer a client into a Bookshelf based surround system at the entry point rather than a floorstander. Increasingly they are buying instead a stereo amp with bookshelf speakers running a Turntable and a Sonos Connect with just the stereo audio output from the TV or Blu Ray Player/Apple TV for movies.